For my Saturday Nite Nightcap 'Wayback in August, on a Hot Summer's night, remember those, eh? I tuned in for what was only my second helping of GP2 this season, having only caught the televised Hungary Feature race prior to this year's GP2 Feature Race during the Belgian Grand Prix weekend. As the lead announcer's name makes me wonder? As Alex Jakes, who definitely sounds like a Bloody (British) Bloke to Mwah; Hya! Makes me wonder if there's any relations to current British IndyCar driver James Jakes, eh? While it seems a shame that reigning GP2 champion Jolyon Palmer, who's probably ruing his "Simulator Jockey" status at the forlorn Lotus F1 outfit - strangely is tasked as the series current Driver Analyst, nee Colour Commentator, a la Davey Hamilton's role for Indy Cars. But back to what 'Ol 'Awntie Harriet used to call the B-I-G' BOYZ! Nee the Talking Heads of Formula 1 and IndyCar. As the crew's all set on the F1 side, it's just over here Stateside that we get a continuous revolving door cast 'O characters. With the likes of Leigh Diffey having Brian Till and Kevin Lee stand-in for him. Whilst various Driver Analyst's from 'Hobbo, aka David Hobbs to Steve Matchett, Townsend Bell and Paul Tracy all take turns in the booth. Hence, with these continuous changes, it's really tough for Mwah to choose between "Professor Matchett" or Townsend Bell for third, or is I-T second fiddle; Err Chair; Hya! Because 'Ol 'PT, nee thee Thrill from the West Hill, aka Paul Tracy has quickly ascended to my number two voice on "Peacock-lite's" IndyCar broadcasts. Although actually No. 1, but I'll leave our Mate Diffey in the B-I-G' Chair; Hooah! Therefore being torn between Bell & Matchett for NBCSN IndyCar Booth Co-commentator - since I enjoy both of their personalities and what they bring to the broadcast. As guess I should be happy with either, right! Meanwhile, I can NEVER get enough of "Professor B," aka Jon Beekhuis, or simply 'JB, which I've already noted previously. As Jon's silky smooth explanations of whatever he's diagramming for us just comes across so effortless, yet totally understandable and never belittling, while always straight to the point. As I'm very happy to hear he's SMART enough to not even consider taking any of Indy Cars Officiating or Technical positions currently on offer! While Matchett's somber tone just reinforced my initial thoughts, although Kudos to the entire crew for being sensitive and reserved during the whole matter - as everybody was extremely professional over what ultimately turned out to be the death of another beloved racing driver! Alas, originally my intent was to compare all of the voices I listen to as a visually impaired 'Vurd Bothcerer, or as Ralph Sheehan so complimentary coined us: "Keyboard Warriors!" Yet as I've already scribbled prior to finishing this, along with deciding to "Pull" my riveting two part Harmony on the Top-5 drivers contesting this year's IndyCar championship, pre-finale. Although I did turn my television back on at 5PM Pacific, which due to the length of the Pocono catastrophe - was delayed by 18mins; as we Don't wanna interrupt our brand new TV Series Mob Steel! Thus I tuned out of the F1 race, since Lewis Hamilton was waxing the competition again; YAWN! And listened to Speed Freaks instead. Then learned the dreadful news via Curt Cavin's report in the Indianapolis Star Monday night. As it must have been Monday morning when guess what? NBCSN was re-airing the 'RASSCAR race; Ho-Hum; Yawn! Which made me realize just how marginalized Indy Cars become. Since if it had been a "Taxi Cab" driver, it would have been splashed A-L-L over TV Land! As IndyCar doesn't even have one single outlet, let alone their own Talk Show, a la 'RASSCAR AMERICRE! Meanwhile, returning to current racing action at hand, obviously as a blind 'Vurd Botcherer', naturally I depend upon the traditional ways of news gathering, i.e. ; TV, Newspapers, email and Internetz; GULP! While the majority of the world is Hip with the ever ceasing shrinking 'O information, i.e. ; World Digitalization of making everything tinier 'N tinier to fit upon today's requisite Smart devices, as surely there's an App for that, right? As I was feeling quite conciliatory when I began scribblin' this, but that went away pretty F-A-S-T! Since if only Indycar.com could add a FREAKIN' Screen-reader compatible "Play" button! Or just something as simple as Trackside with Cavin & Kevin's website page actually listing when the next FREAKIN' Broadcast will be; URGH! As NOT everybody in the world wishes to live vicariously thru TWIT-ER! 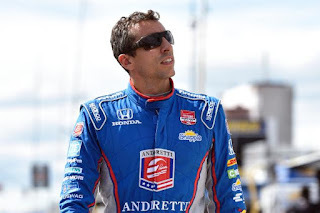 Alas, as mentioned above, having felt pretty deflated over what would be Justin Wilson's deathnoll, I really didn't care one iota 'bout that day's re-airing of the Belgian Grand Prix and originally wasn't planning on watching the Sonoma IndyCar race. Which ironically, Mother Nature decided for Mwah in what seemed emblematic of this year's season. So riddle me this Mr. Queiry; Hooah! Just what does a Blind person do when the power goes out? Hey, I dunno, I'll go read a book! Oh, wait, that's right, I'm FREAKIN' Blind; Thank You, Thank You Very Much; Cymbal Crash please! Yet thanks to my NFB Newsline for The Blind telephone service and its local servers not being wiped out - until my telephone went dead around 7:30PM Sunday evening! I was able to keep abreast of the Qualie' outcome, initial review of Power v Montoya incident, etc, albeit somewhat delayed. Awoke Sunday morning wunderin' if thy power would come back "Just-in Time" for the race, which around 1PM Pacific I resigned myself to missing the finale, and was all set to listen to some Football; Err what us Yanks' calls Soccer. As the Seattle Sounders FC were taking on arch rival Portland Timbers. Yet for some unknown reason, guessing 'cause I had some time to Kill! I scrolled over to my 'lil AM1380 Fox Sports radio station out of Everett, WA and was completely blown over to hear "The Voice," albeit very scratchy thru my headphones of my 'Ol School portable radio; EUREKA! Since I cannot recall lately being so excited over getting to listen to something on the radio! And the whole Gang was there, with my Buddy's Mark Graveley' James & Jake "The Riddler" Queiry as Paul Page's trusty Wingmen. Whilst my favourite IMS Radio Network Pit Reporter Nicky Salt' Yeoman was back, along with Dave First and Mike "Yippee Aye Eh!" King's reincarnate Michael Young's rendition of: "ARE YOU READY RACE FANS!" In the building; Err Sonoma grounds; Hya! As I could hear "Mr. Excitement's! "(Michael Young) Words as long as I positioned the radio just right upon the table next to the window facing northwards - as long as I didn't turn my head too far, making the headphones turn, which moved the radio & headphone chord acting as a pseudo-antenna LOSE the signal; Hooah! And with NO Disrespect to Davey Hamilton, who was back in the booth at Sonoma, the only person's voice missing was Zachery Veach, who I know would much more rather be behind a steering wheel! Yet I really enjoyed his time alongside Paul Page earlier this season. As I've also already previously mentioned, I only made 'Juan 'lil mistake during the entire +35mins Pre-amble & entire race broadcast. Placing one short telephone call upon my own accord during what was a commercial break when I originally thought DJ WillyP' had looped I-T Solo once again - totally missing the original call upon Penske team-mate Juan Pablo Montoya's LUV' Tap; Aye Karumba! As its majorly disappointing - whilst the media's all Uh Glitter over their improved ratings that we'll have to wait another seven FREAKIN' months before another race broadcast! I mean talk 'bout your momentum killer! Did I mention already how it'll be another seven long, hard, cold months before we go racin' again; Hya!